Praxis Coffee uses a 15:1 water to coffee ratio for the French Press. 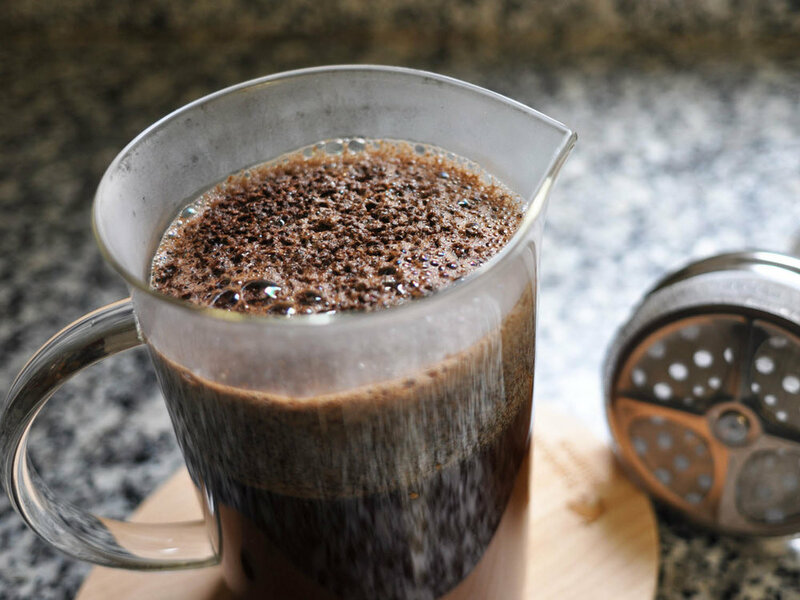 First, bring your cold filtered water to 202° F. While your water is coming to a boil, go ahead and grind 64 g of Praxis coffee to a coarse grind (similar to bread crumbs) and use very hot water to pre-heat your press (rinse water does not have to be boiling, we just don't want to "shock" the brewing coffee with a cold vessel). Once your water has reached 202° F, pour out your rinse water from the press and drop all 64 g of coffee into the bottom of the press. Set your press on your scale and start your timer. Now gently pour water in a spiral motion over your entire coffee bed, filling the press half full. Wait 30 seconds, then use a spoon or wooden paddle to break the crust (the coffee layer on top) and fully submerge the coffee. Pour remaining water (963 g total) nearly to the top of the press, leaving just enough room for the top of the press to sit. Don't press the plunger down yet! At 3:45 minutes, gently plunge your coffee and serve immediately. Your total brew time should be 4 minutes. Serve your coffee immediately. Leaving coffee in the press can over-extract it.